There has been a lot of media attention lately over the 50th anniversary of The Sound of Music (DVD/Download). That’s all the excuse I need to watch Julie Andrews frolic through the Austrian alps with a ragtag group of drapery-wearing children. The Sound of Music is a great film for springtime, and as I drive past fields of Texas bluebonnets, I can’t help wanting to pull over and burst into “The Hills are Alive.” Thankfully, I don’t (you’re welcome, Texas). Only Julie Andrews and apparently Lady Gaga can pull this off. The Sound of Music is about a nun-in-training who becomes the governess for a wealthy Austrian family just before WWII. The Von Trapp children lost their mother years ago, and their widowed father is a harsh disciplinarian. Since Julie Andrews is so good at handling precocious wealthy children, she plays the governess Maria. She teaches the kids to have fun, sing, dance, and melt their father’s heart. 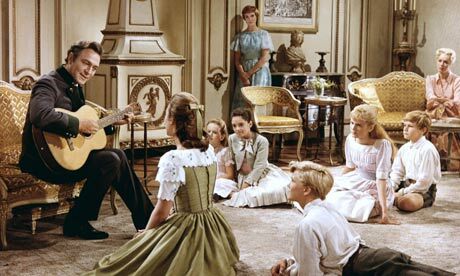 Captain Von Trapp is played by Christopher Plummer, and his secret attraction to Maria makes him pretty dreamy. Catchy songs by Rogers and Hammerstein make this a fun movie to watch, despite the creepy puppet show about 90 minutes in, and Maria’s heinous outfits. Thank heavens Captain Von Trapp briefly dates someone with style, the Baroness Schraeder. She gets a bad rap, wanting to send the kids to boarding school, but I actually really love this character. She wears gorgeous clothes, hosts fabulous parties, gets to date Captain Von Trapp, and is terrible at sports. A lady after my own heart. We first meet The Baroness when she arrives in Salzburg with “Uncle Max”. He is the original cool uncle, and certainly no stranger to a cocktail. Unfortunately his good times are shattered when The Baroness serves him pink lemonade on the veranda. 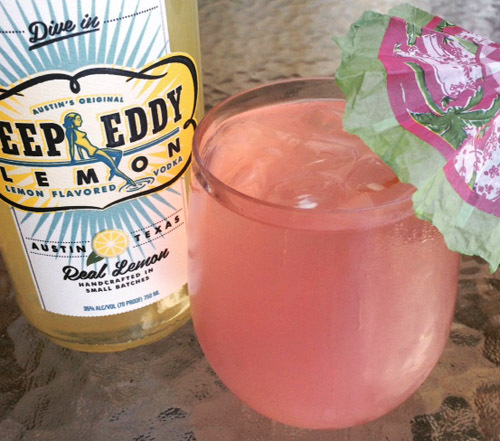 Just… lemonade. Max deserves better, so in his honor, while watching The Sound of Music, I recommend drinking a Pink Parasol. Build drink over ice, stirring gently before topping with club soda. Garnish with a pink parasol. I wonder if Marta ever got hers?? It’s hard to pick a favorite song in this stellar musical. “My Favorite Things”? “Edelweiss”?? “Sixteen Going on Seventeen”??? GAH- there are so many!! This movie makes me want to go to Salzburg and celebrate them all. Except the creepy puppet song- I can skip the yodeling. Cheers! Posted in Classic Films, Musicals and tagged Christopher Plummer, Eleanor Parker, Julie Andrews, Maria Von Trapp, Pink Lemonade cocktail, Salzburg, The Sound of Music, WWII. Bookmark the permalink.